Citation Information: J Clin Invest. 2006;116(5):1174-1186. https://doi.org/10.1172/JCI28553. Table 2 and neurophysiological pathways activated during pruritus (pruritogenic itch). Exogenous or endogenous mediators stimulate specific subtypes of peripheral nerve endings of primary afferent neurons (pruriceptors). High-affinity receptors for pruritogenic mediators transmit the stimulus via intracellular signaling from the periphery to the dorsal root ganglia (DRG) and the spinal cord. Within the spinal cord, itch signals can be modulated (see It is the brain that itches, not the skin). From lamina I, a specific area within the dorsal horn of the spinal cord, the signal is transmitted to the CNS after crossing to the contralateral side (see Figure 3). Activation of specific areas in the CNS results in the perception of itch, leading to discomfort and a scratch response. Additionally, the associated peripheral axon reflex may lead to the release of mast cell–stimulating neuropeptides (e.g., SP), thereby amplifying pruritus via release of histamine, tryptase, and TNF-α, for example (see Table 1). This figure does not consider the interaction between pain and itch fibers on the spinal cord level (see The enigmatic neurophysiology of itch is becoming increasingly understood). 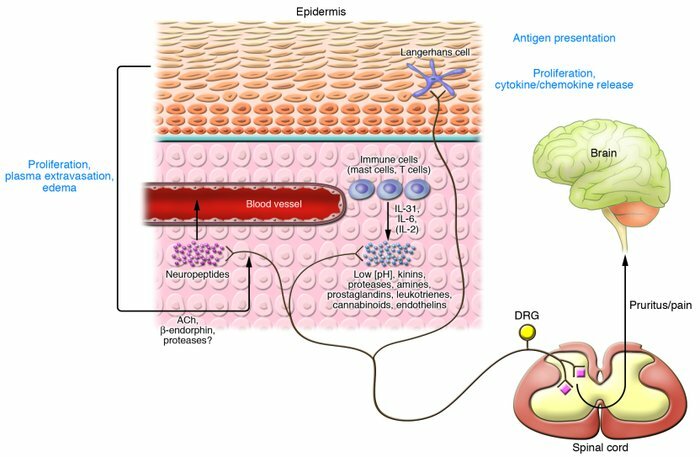 Figure modified with permission from The Journal of Investigative Dermatology (5).